a complement of teeth, either natural or artificial; ordinarily used to designate an artificial replacement for the natural teeth and adjacent tissues. complete denture an appliance replacing all the teeth of one jaw, as well as associated structures of the jaw. fixed partial denture a partial denture held in position by attachments to adjacent prepared natural teeth, roots, or implants; called also bridge. implant denture an artificial denture or single tooth retained and stabilized by a framework or post implanted in the bone. A subperiosteal implant. From Darby and Walsh, 1995.
overlay denture a complete denture supported both by soft tissue (mucosa) and by a few remaining natural teeth that have been altered, as by insertion of a long or short coping, to permit the denture to fit over them. partial denture a dental appliance that replaces one or more missing teeth, receiving support and retention from underlying tissues and some or all of the remaining teeth; it may be either permanently attached or removable. See fixed partial denture and removable partial denture. removable partial denture a partial denture made so that it can readily be removed from the mouth. a restoration of one or more missing teeth that cannot be readily removed by the patient or dentist; it is permanently attached to natural teeth or roots that furnish the primary support to the appliance. a partial denture permanently held in position by attachments to adjacent prepared natural teeth, roots, or implants. A restoration of one or more missing teeth that cannot be readily removed by the patient or dentist; it is permanently attached to natural teeth or roots, which furnish the primary support to the appliance. Restoration of one or more missing teeth that cannot be readily removed by patient or dentist; permanently attached to natural teeth or roots that furnish the primary support to the appliance. Synonym(s): bridge (3) , fixed bridge. n See denture, partial, fixed. 1 Dental implants and resin bonded fixed partial denture are the most suggested treatment options, when the nearby teeth are available in ideal position with proper occlusion. A Photoelastic stress analysis of stress distribution in bone supporting fixed partial dentures of rigid & nonrigid designs. 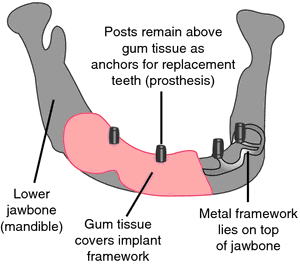 Meta-analysis of fixed partial denture survival: prostheses and abutment. All-ceramic fixed partial dentures designed according to the DC-Zircon[R] technique. The use of ceramic materials to produce large frameworks, such as those in three- and four-unit fixed partial dentures (FPDs), has been enabled by the introduction of CAD-CAM technology (computer-aided design-computer-aided manufacturing) in dentistry and by the development of high fracture toughness zirconia-based ceramics. Due to a universal nature of the research, FEM is a powerful and effective tool for predicting the mechanical behavior of dental restorations, fixed partial dentures and implant supported prostheses. of Oklahoma) introduces new and experienced practitioners and undergraduate and graduate students to restorative dentistry dealing with fixed partial dentures and cast metal, metal-ceramic, and all-ceramic restorations. Nilner, All-ceramic fixed partial dentures designed according to the DC-Zirkon[R] technique: A 2-year clinical study, J. Designed for practicing dentists and dental technicians, the text covers the scientific aspects of dental ceramic materials, processing methods, veneers, all-ceramic single crowns, non-vital abutment teeth, external bleaching, all-ceramic fixed partial dentures, bonding of ceramic restorations, and all- ceramic implant supported restorations. These restorations included porcelain fused to metal crowns, four root canals, a full-gold crown, and two three-unit fixed partial dentures (bridges). Fixed partial dentures in relation to maxillary and mandibular teeth except mandibular molarseither ceramic or stainless steel if the teeth condition permits.